The Prime Minister claims that austerity is over. But that’s hard to believe with one in five people in the UK living in poverty – and over half of them from working households. The reality is that too many people do not earn enough to live on. If the Tory government’s so-called ‘national living wage’ lived up to its name, we wouldn’t have record numbers of people relying on food banks and finding themselves homeless or in emergency accommodation. Last week, the Chancellor announced the ‘national living wage’ would rise from £7.83 to £8.21, but this increase is still not enough. The real living wage, the only wage based on the cost of living and calculated independently by the Living Wage Foundation, is considerably higher: £8.75 across the UK and £10.20 in London. Local authorities have an important role to play in promoting the real living wage. We have a duty to support our residents and help them live independently and fully, but we cannot do this if people don’t earn enough to live securely. By encouraging local businesses – large and small – to become accredited, we can work together to tackle poverty and low pay in our communities. That’s why it is so important we celebrate Living Wage Week this week (5th – 10th November). I am proud that Lewisham Council is one of the councils leading the way on the real living wage. In 2012, we were the first council in the UK, alongside Islington, to become an accredited living wage employer. As well as ensuring all our hard-working staff earn a real living wage, we also require our contractors to do the same for their employees. Led by Cllr Joe Dromey, cabinet member for finance, skills and jobs, we’ve been working hard to encourage businesses to follow our example. Our manifesto for the local elections in May included a commitment to double the number of living wage employers in Lewisham, which we’ll achieve by rolling out our business rate discount for employers who pay fairly. Paying the real living wage clearly help employees, but there are also significant benefits for employers. Research from the Living Wage Foundation shows that 93% of living wage businesses have benefitted since accrediting, with three quarters reporting increased motivation and retention for employees and 58% reporting improved relationships between managers and staff. 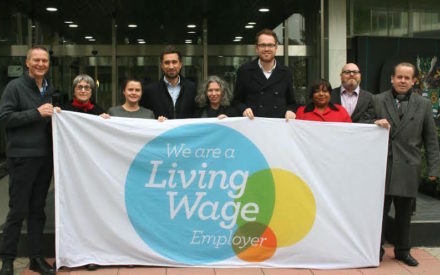 Lewisham Council has a range of activity planned throughout Living Wage Week to celebrate living wage employers and encourage others to become accredited. On Friday, the Mayor’s Business Awards will celebrate the contributions of local businesses to our vibrant community, with a special award for living wage employers. Local MPs and councillors will be visiting living wage employers across the borough to show their appreciation, as well as encourage others to sign up. We will also be writing to the largest 100 companies in the borough to encourage them to join our growing family of living wage employers. Only a Labour government will tackle the scandal of in-work poverty by introducing a real living wage. The number of Labour councils across the country who have become living wage employers and are encouraging local businesses to do the same is proof of our commitment to build an economy for the many. Damien Egan is mayor of Lewisham.